Do you ever wonder why achieving results is such a struggle? Do you want that to change? Let Jez show you how to train your brain differently by uncovering strategies used by some of the most successful people in the world. Using real-world examples the former comedian examines why some people struggle to achieve, despite trying, while others appear to achieve extraordinary results. Jez will show you why we behave the way we do and how to change for the better. By changing the way we think, our behaviour and approach to life will also change. Aware that our success is also a result of other people, Flip the Switch will show you how to improve the behaviour and thought patterns of those around you too. 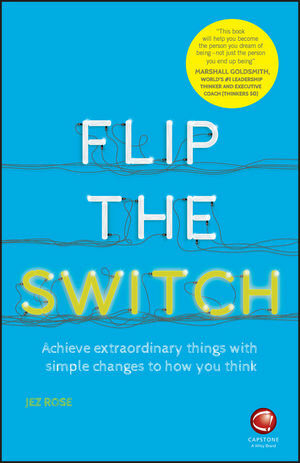 Flip the Switch: Achieve Extraordinary Things with Simple Changes to How You Think will change how you approach success and leave you ready to take on the world. Jez Rose (www.thebehaviourexpert.com, Milton Keynes, UK) is a behaviourist with more than 10 years' experience working with some of the largest leading global brands. He is an international speaker and the presenter of countless practical, down to earth training events, programmes and video series. Jez speaks around ten times per month with an average audience size of 300+, though he does often work with smaller, more senior groups of 15 mangers and at least five times a year he speaks to audiences of over 3,000. He is best known for his humorous and engaging training presentations as the UK's leading expert in developing higher performance for entrepreneurs, corporate leaders, managers, sales and service professionals, corporate employees, and education professionals - through his company The Behaviour Expert. Jez is a thought leader in the field of behaviour and speaks on effective, real-world training and strategies on the subjects of behaviour change, customer service and effective leadership. His leadership training is accredited by the Institute of Leadership and Management. Jez has also been a featured guest on more than 100 radio and television programs - including: BBC Breakfast; Extraordinary People for The Discovery Channel; LBC's Nick Ferrari show; Loose Lips with Melinda Messenger; The Big Breakfast on Channel 4 with Melanie Sykes and Ben Shephard; BBC Radio 2 with Jeremy Vine; BBC Radio 4's Word of Mouth with Michael Rosen; BBC Radio 4's All in the Mind with Dr. Raj Persaud; QVC; his own show for ITV1: Jez Rose All in Your Mind and many others. Jez uses his unique insights into behaviour change, and his extensive speaking on the subject, to provide meaningful motivation to reach your full potential in each area of your life. The book is very uplifting, written in a conversational and funny tone – Jez's background in comedy comes through in the style. Practical techniques, examples and advice on how to change your mindset are included throughout the book – these methods are proven techniques that Jez has taken directly from his consulting work with clients in many different industries.